Calling all teens! Do you love plants and nature? Do you enjoy interacting with children? Are you looking for a fun way to spend your summer? Do you need to complete service hours or gain positive experiences to put on your college application? Then check out the Garden’s SAGE Service Program! 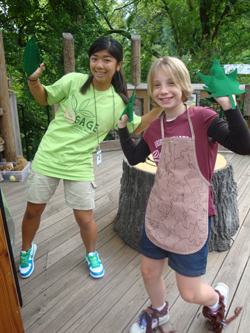 The Students as Garden Educators (SAGE) program provides students ages 14–18 with an opportunity to lead fun activities about plants and nature in the Children’s Garden. SAGE volunteers help families learn about topics like habitats, pollination or plants we eat. Through fun and educational activities these students plant seeds of knowledge and inspire our youngest visitors to enjoy nature! Applicants to the program should be out-going, willing to work outside during summer months and eager to learn new material and share their knowledge with others. The SAGE Service Program is a great way to earn service hours, but has other benefits as well. You can improve your public speaking and teaching skills. Garden staff will work with you one-on-one as you learn about plants and nature. You can also meet students from other schools, and enhance future college and job applications! Students are required to attend one 7-hour orientation session (lunch included) and volunteer at least 50 hours between May and October. For each shift, students are expected to arrive on-time, be prepared and act in a professional and respectful manner while on Garden grounds. SAGE students can volunteer between May and October each year. Shifts are available seven days a week, 10 a.m. to 2:30 p.m. (lunch break included). Evening hours are available during Member Tuesday Nights and the Whitaker Music Festival concert series on Wednesday nights. Staff will work with you to accommodate other commitments. One teacher recommendation letter is required for each student. Recruitment begins February 1, 2019. Orientation Session is Sunday, May 19, 2019.